Mom Rachawongse (M.R.) Kukrit Pramot (also spelled Pramoj) was something of a renaissance man in modern Thai history. Educated at Oxford, he started the Siam Rath newspaper on his return to Thailand. He entered politics after World War II, starting Thailand's first political party, and eventually became Prime Minister during the turbulent 1970s. Along the way, he also maintained a keen interest in the dramatic arts, and even acted in the 1963 Hollywood production of The Ugly American starring Marlon Brando. He also wrote many short stories, novels, stage plays and poetry. M.R. Kukrit was also a scholar with a keen interest in Thai and Asian culture, and authored several reference works on the subject. He was awarded the title of National Artist by the national culture commission in 1985. M.R. Kukrit passed away in 1995 at the age of 84, leaving instructions that his home be opened to the public. Photos of the M.R. Kukrit Heritage House. Click on any of the thumbnails to see the full size image. M. R. Kukrit's house reflects his deep interest in Thai culture, and his own efforts at preserving it. The home is the result of over 20 years work. While it now appears as a unified whole, the various buildings were purchased separately from different places around central Thailand, disassembled, and re-assembled in the present location. One unique aspect of traditional Thai houses is that they are actually made to be movable in this fashion. Some of the structures are more than 100 years old. The main buildings, five of them in all, are arranged in very typical Thai fashion on an elevated platform around an open courtyard. A sixth building, a large open-sided pavilion with a stage, is separated from the main house group by a small garden decorated with small bonsai plants. The stage was used for traditional dance performances, and on either side of it are display cases storing the late statesman's collection of khon masks. In the residential group, the largest building was used for receiving special guests. At one end is an old wooden bed thought to have been the royal bed of King Rama II, M.R. Kukrit's great-grandfather. A display cabinet in the room displays some royal regalia, but you're not allowed to enter to view them up close. Flanking either side of the reception room are smaller buildings. The one closest to the stairs is the family chapel. The altar displays many Buddha images given to or collected by M.R. Kukrit over the years. The other small structure was used as a more informal sitting room, where the late statesman could relax surrounded by many souvenirs of different places around Thailand. On one side of the court is the bedroom, which is divided by ornately carved wooden screens. Facing this is the library, containing many books in English from M.R. Kukrit's days at Oxford. The room was also used for party meetings. In front of the library are more miniature trees, including fruit trees. At the end of the courtyard is a small "bird watching" pavilion overlooking the large rear garden. There's a large lily-covered pond immediately below the pavilion, with a large lawn beyond. There are two more small pavilions on either end of the lawn. The M.R. 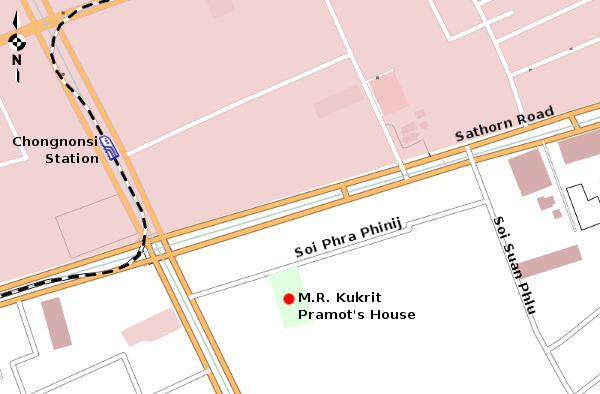 Kukrit Heritage Home is located on the small side street of Soi Phra Phinij, near the very busy Sathorn Road. By public transportation, the easiest way to get there is by Skytrain to the Chongnonsi Station. From the station, use the elevated walkways to cross Sathorn Road and descend to the street. Soi Phra Phinij is the first side-street you will come to. The heritage house is about 100 meters up the road on your right. The house is open every day from 10:00 am to 4:00 pm. However, it is frequently used for private functions, so it is advisable to have your hotel call them to check they are open to the public before you go. The telephone number is 02 286 8185. Admission is 50 Baht (1.30 USD) for adults. See the M.R. Kukrit Heritage Home web site for additional details. Note: "Mom Rachawongse" is a title within the Thai system of nobility. It indicates that the person is [most likely] the great-grandson of a King. In English, when necessary, it is translated as "The Honorable" but most of the time is simply abbreviated M.R.